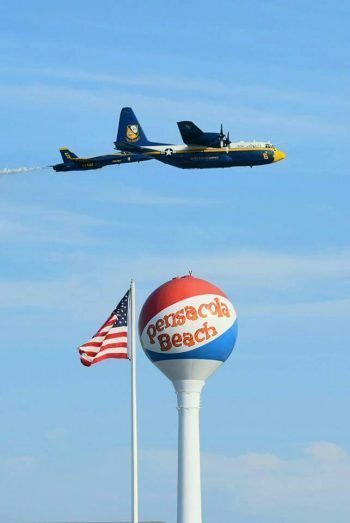 We will be running our 4 hour Gulf Side Blue angels Trip at 12:30-4:30 pm on 07/06/17 & 07/07/17. This is by far the best place to watch the Blues Fly. we head out looking for Dolphin along the way, we go all the way around the island out to the gulf of mexico. we drop anchor and put the swill ladders in the water and watch the blues fly. its amazing to watch the jets right over head!! please feel free to bring food and drinks along we have a large cooler on the boat that you can use or bring your own. One Response to 4-Hour Gulf Side Blue Angel Tour!! Still have room on the best trip of the year. 4 hour trip to watch the blues fly. we anchor on the gulf side put the swim ladders in the water and relax watching the U.S. Navy Blue Angels over head!! !